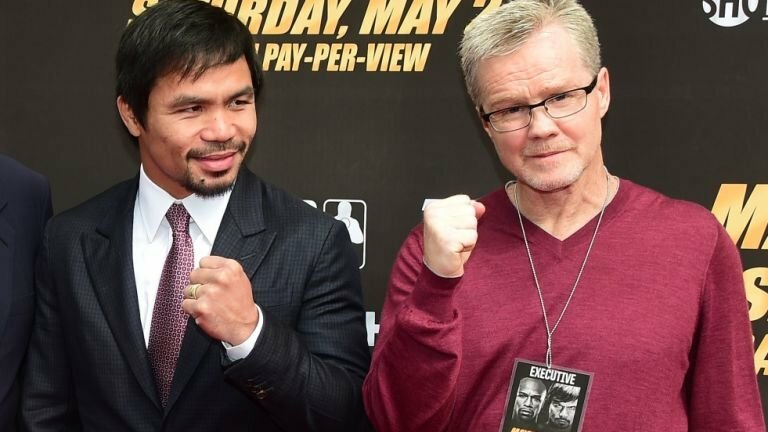 Hall of Fame trainer Freddie Roach believes that Adrien Broner 33-3-1 (24) will struggle to keep up with the pace of his charge Manny Pacquiao 60-7-2 (39) when the duo meet at the MGM Grand Garden Arena in Las Vegas, Nevada this Saturday night. This is despite the 29-year-old Cincinnati native maintaining an 11-year age advantage over the Filipino veteran, who turned 40 last month. The difference, says Roach, is due to Broner’s behaviours away from the gym. Coach Roach isn’t expecting Broner to come out firing despite his big talk ahead of the fight. Pacquiao’s superb conditioning will be the difference in the fight according to the Wild Card Boxing Club’s head coach. “Manny still plays basketball for up to four hours at a time. There is no way Broner will be able to keep up with Manny’s conditioning and stamina,” continued Roach. The bout will mark the first time Pacquiao has fought in the United States in more than two years after knocking out Argentinean banger Lucas Matthysse in Kuala Lumpur, Malaysia last year and dropping a close decision to big Brisbane welterweight Jeff Horn in Australia in 2017.